June flew by in a frenzy of planting, harvesting, weeding, and watering–Wednesday is July 1 already! We have coined a new word here for how tired we are: “Exhausterated.” Farmer epitomizes the exhausterated look when he passes out on the couch every night with his eyes rolling back in his head; it’s hard work being a farm dog on a busy farm, after all. 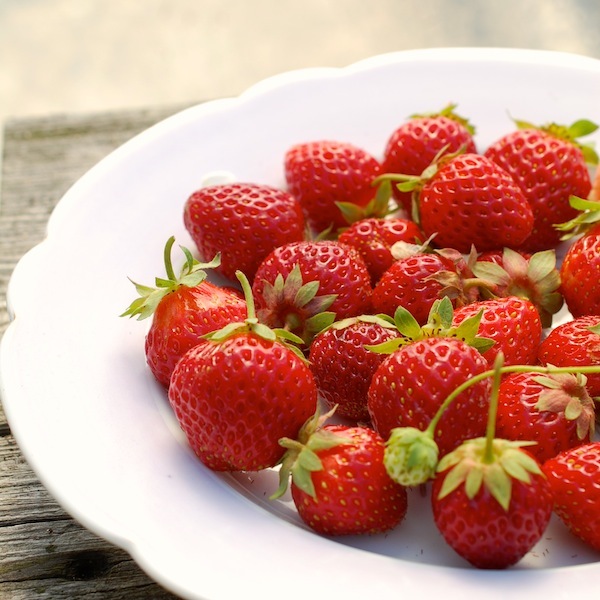 The best thing about this June has been the explosion of strawberries. Remember last year I was all giddy because there were finally enough for me to snack on every day–but not enough to sell? Well, I don’t know if it was the cold winter or the compost I dumped on the patch last year or a little pruning and separating we did, but this year our one little fat row of strawberries yielded hundreds, probably thousands of strawberries. Enough for us to sell some at the farm stand most days, and still have leftover “house” strawberries. Libby and I made our first batch of ice cream for the summer. Both of us rank fresh strawberry ice cream right up at the top of favorite flavors. (In a few weeks, we’ll be able to make black raspberry, too.). We made shortcakes with a lot of whipped cream, and there are still enough strawberries left out there for me to make a batch of Gingery Strawberry Rhubarb Crisp with Brown Sugar-Pecan Topping, that killer recipe from my cookbook, Fresh From The Farm. 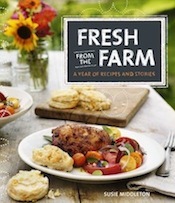 Oh, and that reminds me, that recipe is just one of many that my publisher, The Taunton Press, has put together into a special “bookazine” called Farm Fresh that is now on the newsstands (grocery stores, Barnes & Noble, Costco, etc.) or available by mail from The Taunton Store. Anyway, there’s no time to think about strawberries anymore. Tonight I picked 13 pounds of shell peas (we planted a lot more this year) and Roy has been harvesting lots of summer squash from his early planting on black plastic. The plants started yielding only 30 days after they went into the ground. 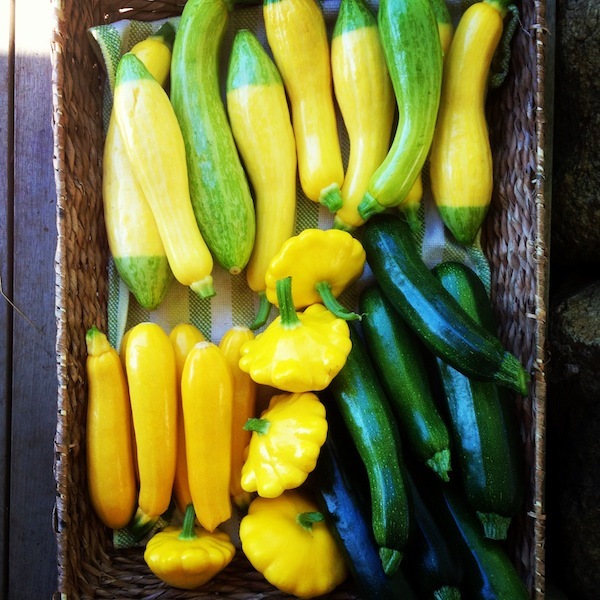 We’re growing “Zephyr” crookneck summer squash with beautiful green tips; bright yellow “Sunburst” Pattypans; “Jackpot” zucchinis; and “Golden Arrow” yellow zucchini. Here’s an iPhone pic–in fact all my photos today are from the phone. Once again, I have a broken camera on my hands–oh well! Here’s to summer eating, and a happy July 4th week. Not since my parents gave me my weekly 50-cent allowance to bike down to Jack’s Market and buy a stash of penny candy have I been quite this excited. 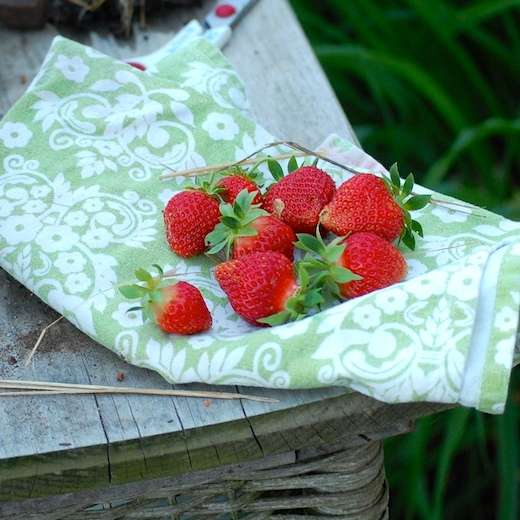 Every morning when I head out to the strawberry patch, I keep looking around for someone to give me permission, or at least to charge me an entry fee to the garden. I just can’t believe there’s a whole row of fresh, ripe strawberries simply lying around in my backyard waiting for me (and Libby, when she’s here) to eat. (Roy’s not much of a fruit guy.) I’m truly and ridiculously giddy about this situation and I am not apologizing. This is the first year we have enough for me to pick a bowlful every morning, but thankfully, not quite enough to sell at the farm stand. Too bad. This means most days, I get to decide how I want to eat them. I’m sure you can guess the next part—it is hard to get inside the house without eating most of them. But I have been practicing discipline. Last weekend, knowing Libby was coming, I saved enough for the two of us to have a nice dessert with whipped cream on Saturday night. We ran out of time to make shortcakes, because we decided to make grilled pizza instead. (If I’d had time, I would have made one of two shortcake recipes from my fabulous baker friend Abby Dodge (author of The Weekend Baker and many other cookbooks). This one is chocolate (oh my! 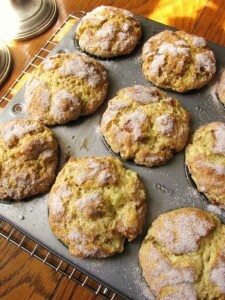 ), the other is a classic tender shortcake that Abby did for a story I worked on at Fine Cooking magazine years ago. But since Libby is a huge whipped cream fan, we were okay with just the strawberries tossed in sugar and topped with vanilla (freshly) whipped cream. Libby remarked at how tasty the strawberries were—I had warned her that they weren’t terribly sweet, because it has been cool here. But I found her comments interesting (she has a sharp palette), because I am finding these Ozark Beauties that we are growing to have a really intriguing citrusy flavor. They’re tangy for sure, and at first I kept looking for that super-sweet flavor you get with say, the famous Earli-Glow strawberry. But now I think that for using in desserts, these are particularly nice, adding an intriguing acidity. The other really cool thing about fresh, ripe, picked-nearby strawberries is how red they are—all the way through. 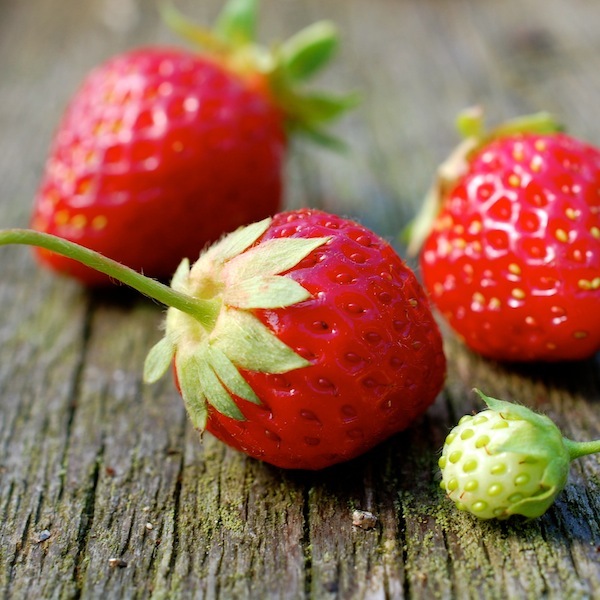 It seems like kind of an obvious thing—that a ripe strawberry should have red flesh—but as you know, most grocery store strawberries are mostly white on the inside. 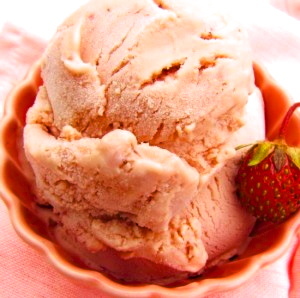 After that, my next batch is definitely going to be my (and Libby’s) all-time favorite: homemade Strawberry-Vanilla Ice Cream. My other favorite frozen strawberry dessert is this Strawberry-Balsamic Granita from Fine Cooking, but Abby’s Strawberry Sorbet looks really good, too. 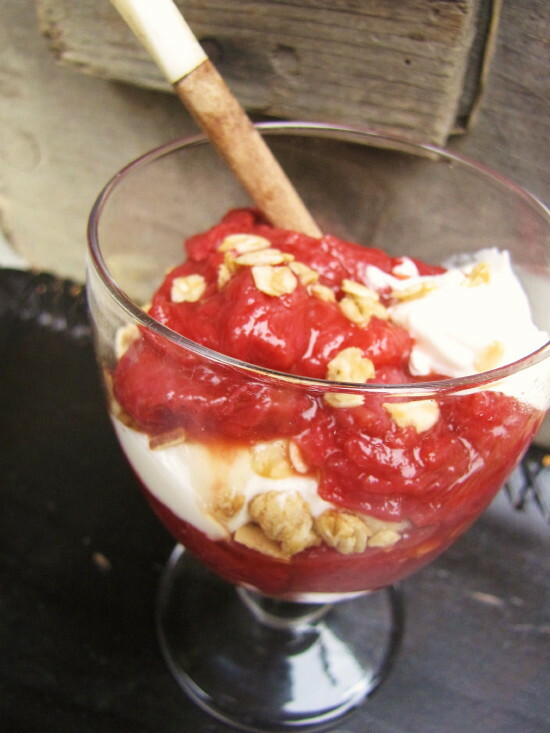 I also see, among the many delicious strawberry dessert recipes Fine Cooking has on their site, an intriguing change-up to strawberries and yogurt—a Strawberry-Yogurt Brulee. Looks easy and delicious. And I remember loving all of Lori Longbotham’s strawberry concoctions, especially her roasted strawberries that she then used for her Triple Strawberry Ice Cream Sundaes–with chocolate-dipped strawberries!. In the last strawberry days (which will trickle through the summer since the Ozark Beauties are everbearing), I will make Farmhouse French Toast with Backyard Berry Syrup as well as Yogurt and Strawberry Parfaits with Homemade Maple Granola (both from Fresh from the Farm). 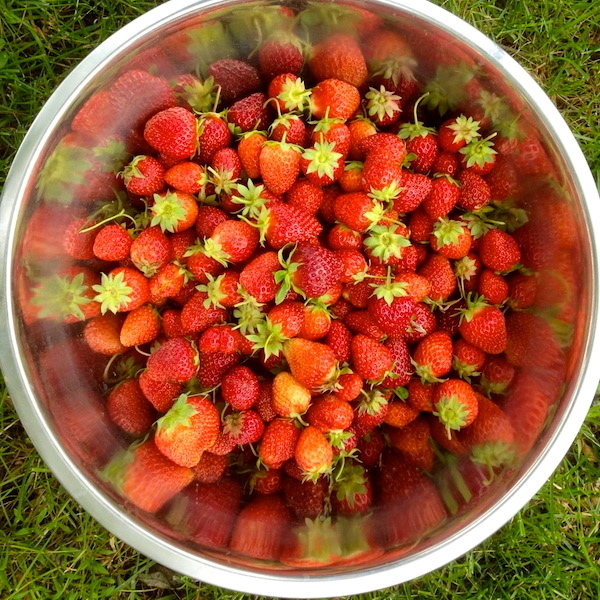 Maybe I’ll even have enough strawberries to finally make jam. I hope so, because my friend Cathy Barrow‘s recent article in the Washington Post (“Canning Class: Strawberry Jam that Works”) totally had me wishing I could stop right then and there and make jam. Heck, maybe I’ll even be able to steer some of my berries to the freezer, so that I can recreate this glee in the middle of the winter. But don’t hold your breath. 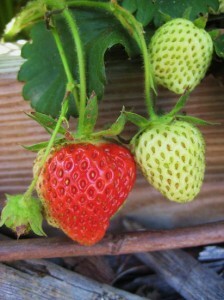 Think I’d better order more strawberry plants and get them in the ground this fall. 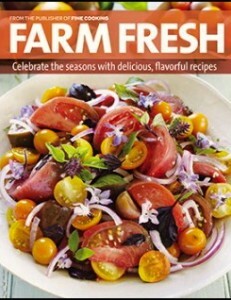 Copyright Susie Middleton, 2014, from Fresh From the Farm: A Year of Recipes and Stories. This crisp rocks. Sweet and tangy with a most excellent crunchy topping, it gets a flavor jingle from two secret ingredients—crystallized ginger and a touch of balsamic vinegar. Cook the crisp until the topping is plenty golden (about 45 minutes)—enough time to let the fruit juices reduce and thicken a bit, too. This looks pretty in a 10-inch quiche pan, but any 2-quart baking dish will work. Great warm with vanilla ice cream, this crisp is pretty tasty leftover for breakfast, too. I should know. Heat the oven to 350°F. Rub a shallow 2-quart baking dish or large ceramic quiche dish all over with a little butter. Bake the crisp until the topping is firm and golden, about 45 minutes. (The juices will have been bubbling around the edges for a bit.) Let cool for 15 to 20 minutes and serve warm alone or with ice cream, frozen yogurt, or heavy cream. A pile of freshly cut rhubarb stalks appeared at our back door last week, courtesy of our neighbor Ralph. This is one of the strange and wonderful things about living on the Vineyard: People are in the habit of sharing…without much fuss or fanfare. Stuff just shows up, unbidden but much appreciated. In the short time we’ve been living in the farmhouse, we’ve been the grateful recipients of beach plum jelly, wild cherry jam, honey, eggs, lobsters, codfish, sweet potatoes, pickles, warm bread and kale soup, to name a few things. 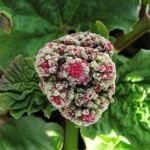 I was particularly excited to see those beautiful rhubarb stalks, since I won’t be harvesting any this year from the new plant I plopped in the ground a few weeks ago at the southeast corner of the garden. As soon as I got the plant, it immediately sent up its monstrous flower stalk. The flower is fascinating (see photo), but after admiring it for a while, I lopped it off, hoping to return the plant’s energy to its stalks. Still, it’s a baby plant and I won’t be cooking from it this year. I knew right away what I wanted to make with the rhubarb gift—a favorite Fine Cooking recipe from years ago. 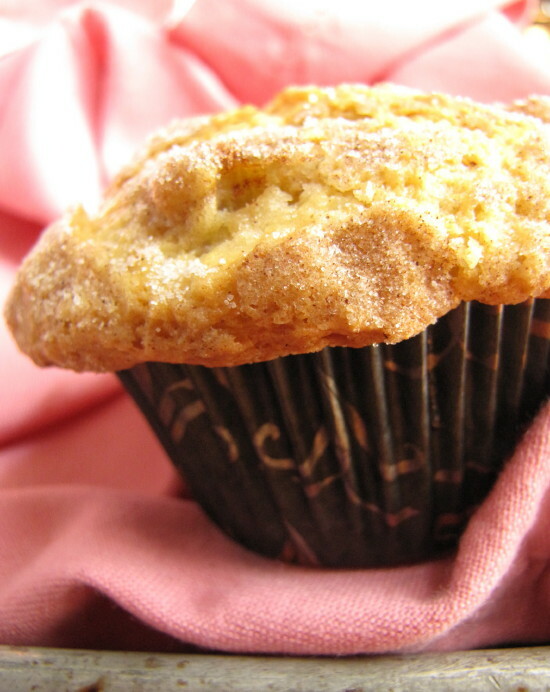 It’s a fabulously tender muffin from award-winning North Carolina baker Karen Barker. The tart little rhubarb bits melt into these light coffee-cake-like treats, which are topped with cinnamon sugar. The batter has sour cream, melted butter, cinnamon, and vanilla in it, and it comes together really easily. Twenty minutes in the oven and nirvana. Roy was home from work cutting and pounding out a piece of copper in his shop when the muffins came out of the oven. So I stopped snapping photos long enough to get a few warm muffins out to him. He likes anything with cinnamon sugar on it, but especially if it’s straight out of the oven. I had enough rhubarb left over to mess around again with a strawberry-rhubarb compote I’ve been tinkering with. 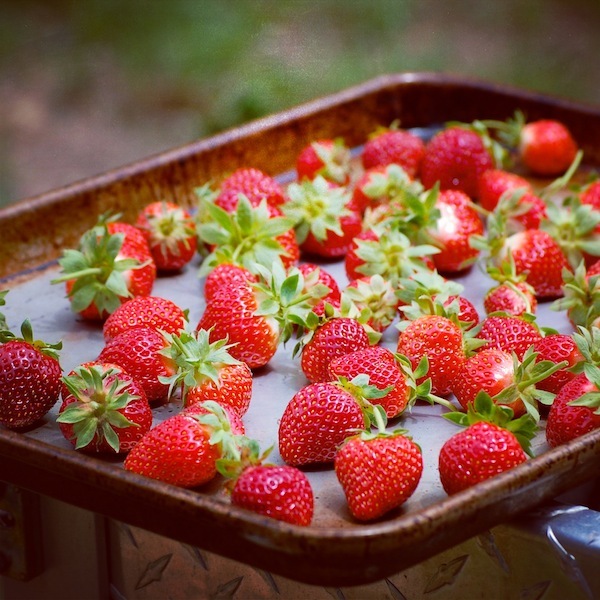 I’ve seen a lot of blog posts lately about roasted strawberries (something we also did at Fine Cooking years ago!) 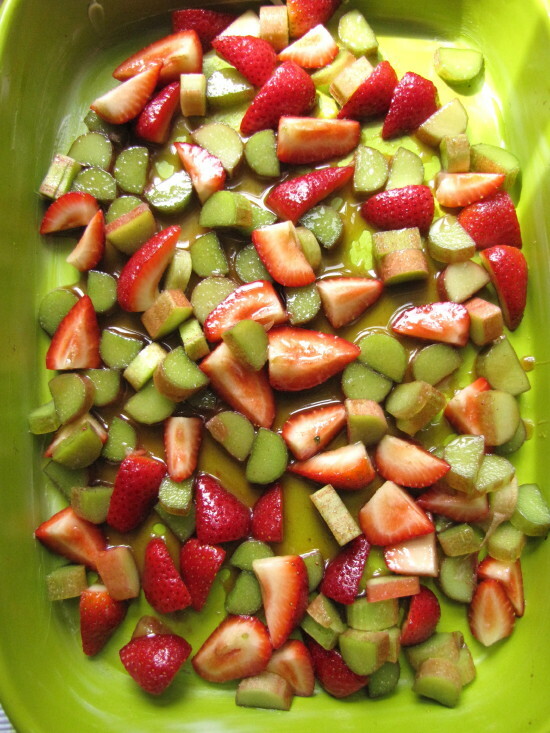 and was hoping I could make an oven–roasted compote with both rhubarb and strawberries that would be a bit roasty-flavored and perhaps would keep the rhubarb together better than a stovetop version. 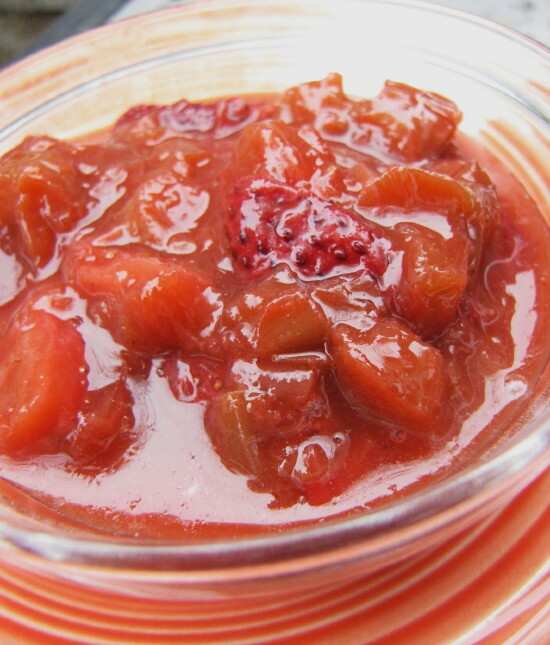 I won’t bore you with my experiments (which included some ghastly rhubarb “chips!”) but I will give you the parameters (below) for the compote as it stands now, because it’s an incredibly easy, versatile, seasonal condiment. I use it most often in my favorite treat—yogurt and granola parfaits—but I also put it in smoothies (with frozen bananas) and on pancakes. And of course it would be great on vanilla ice cream. I’ve resigned myself to a syrupy, soft-fruit dessert-topping-ish kind of compote, and this texture is just a-okay with me. What I’m not quite happy with yet is the sweet-tart flavor balance. My first version wasn’t quite sweet enough and the second version was too sweet. But just futzing with the sweetness won’t necessarily fix this, because rhubarb has a unique tartness that doesn’t really get mitigated by more sweet. 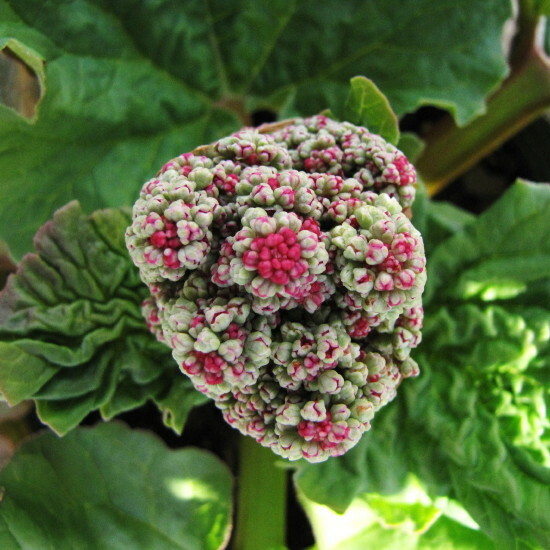 Sweet flavors can hang out with rhubarb, but not knock it back altogether. Too much sweet and you just get cloying. Right now I also have a bit of balsamic vinegar (great with strawberries) and orange juice in this, and I’m thinking to knock those back even more and switch out more of the plain sugar for more maple syrup. (I’m wondering about adding vanilla, too?) But since I probably won’t get to the next version any time soon, I’m leaving the tweaks up to you. (I don’t usually offer experiments on the blog—I like to give you finished recipes, but something like this really does involve a measure of personal taste!) In the directions following, I’m suggesting a middle road on the maple and sugar and a little less balsamic then my last batch. 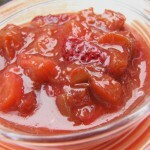 Strawberry-Rhubarb Compote: Heat the oven to 425 degrees and butter a 3-quart baking dish. 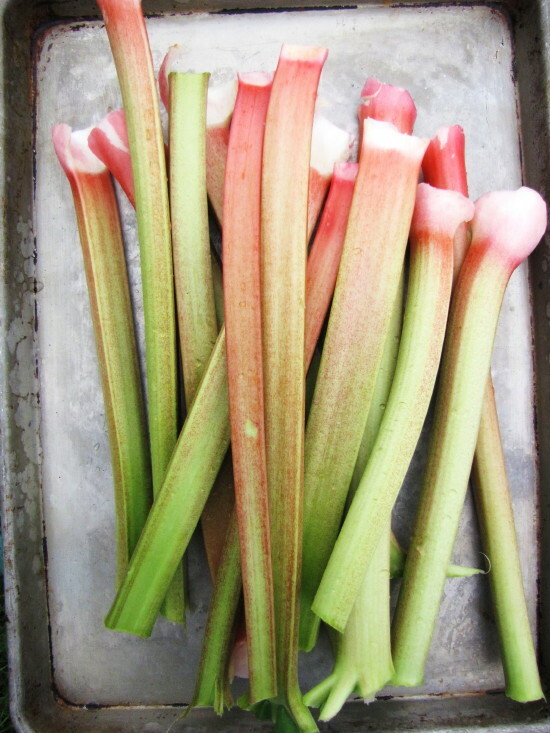 Slice 8 ounces of rhubarb into 1/2-inch pieces (a scant 2 cups), and quarter or halve about 10 ounces of (organic or local) strawberries (2 cups). Put them in a mixing bowl with 2 to 3 tablespoons sugar, 3 tablespoons maple syrup, 2 tablespoons orange juice, and 1/2 teaspoon balsamic vinegar. Sprinkle with a little salt, toss well, and scrape and pour out into the baking dish. Spread in one layer. Bake for 20 minutes, stir gently with a silicone spoon, and continue baking until the liquids are syrupy (but not too reduced or they will burn), about another 6 to 10 minutes. Let cool in the pan, transfer to a glass or ceramic container and keep in the fridge for a week or so. This makes about 1 cup compote. 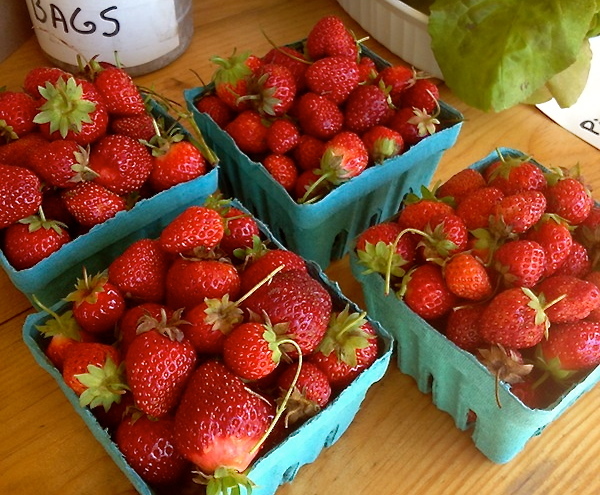 One of my favorite parts about the CSA I belonged to last year was the weekly strawberry picking in June. This year, with my own market garden, I knew I couldn’t join the CSA, but I was resting easy thinking the strawberry patch would be open to the public like it was last year. 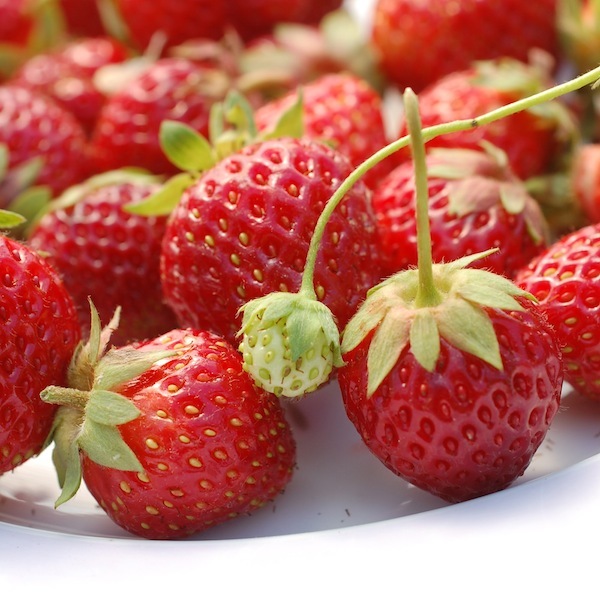 Naturally, due to weather conditions causing blossom drop, the strawberry crop wasn’t large enough to share with non-CSAers. 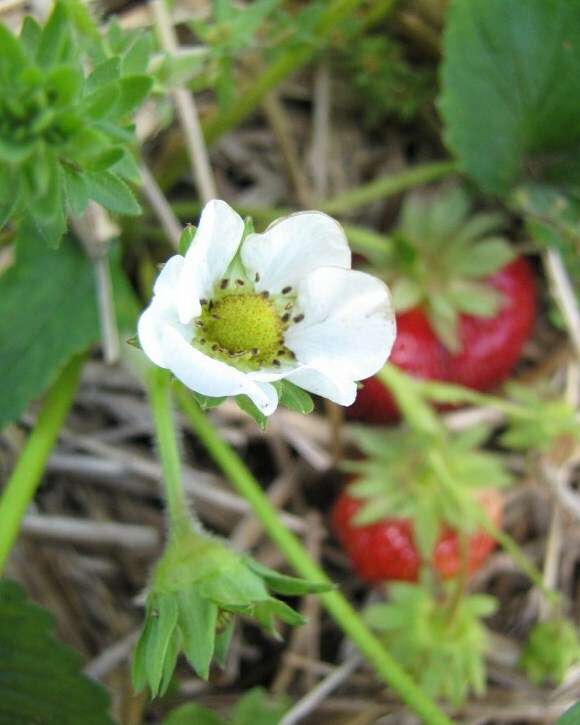 Big bummer, as there aren’t any other pick-your-own strawberry patches on Martha’s Vineyard. Years ago I lived on Aquidneck Island (home to Newport, Rhode Island) and every June we’d head over to Quonset View Farms, high up in the middle of the island where the cold fog off the ocean just kisses the plants and fades away in time for daily sun baths. The soil must be pretty special there, too, as I swear I’ve never tasted strawberries so sweet and juicy. 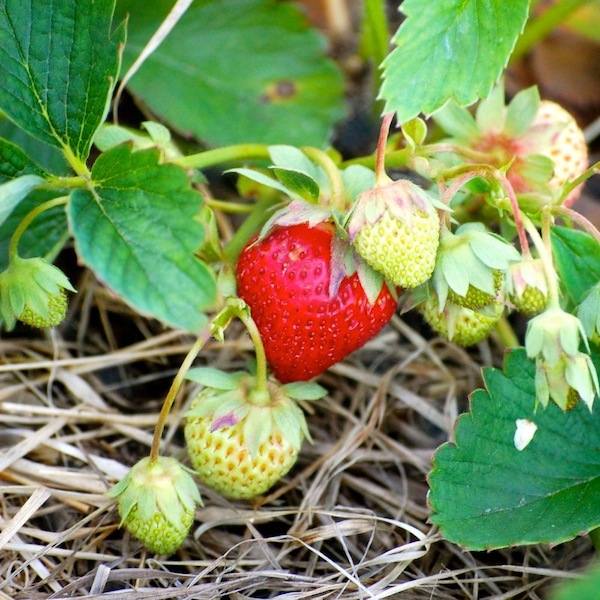 At Quonset View, it was hard to get out of the field without eating most of your berries. Ever since then, I haven’t really been able to eat much in the way of commercial strawberries, which tend to be hard and white in the middle and short on flavor. I wait 11 months for the real deal. It’s kind of torturous, but pretty blissful when the local berries ripen. I try to pick enough to freeze some for later months, too, but they never last very long. My longing was made even worse this year by the fact that Rebecca has been selling strawberry plants at the farm stand where my garden is. 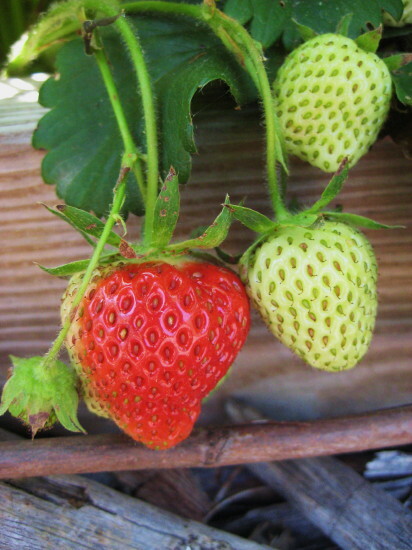 Every day that I pass by these beauties, another berry ripens on one of the plants, red and juicy and drooping seductively on its green stem, just begging to be eaten. I finally broke down and bought a couple of the plants (and plunked them in the garden), mostly because my 7-year-old gardening (and cooking) companion Libby insisted. I tried to explain that strawberries are perennial and also that just a couple plants wouldn’t yield much, but she wouldn’t hear of it. So we have been ritually sharing each single berry on these two plants as they ripen. I also finally got myself in the car and went down-Island to visit two farms that I thought might be selling their strawberries. It wouldn’t be quite the same as picking my own, but time was running out. I struck gold at both Norton Farm and Morning Glory Farm, and I finally had enough strawberries to do what I’ve been waiting a year for—to make ice cream. Last year, the June-July issue of Fine Cooking magazine arrived just before strawberry-picking time, and it had in it the most amazing article on creating your own custom-flavored ice cream. The recipe came from pastry wizard David Lebovitz, and the step by step “create your own” approach is a regular Fine Cooking feature. I thought the format was a brilliant choice for an ice cream recipe, because it allows you to flavor your custard with whatever infusions, add-ins, and/or mix-ins you like to make practically anything—from Hazelnut Chocolate Chunk and Double Ginger to Irish Coffee or Rocky Road. For my first go-round, I knew I wanted something fruity. I have strong memories of home made fresh Delaware white peach ice cream. My father used to make it in a big old fashioned ice-cream maker on the front porch of our beach cottage in August when I was a little girl. Profoundly comforting. I knew peaches weren’t in season yet (and sadly, not nearly so good up here), but that strawberry patch was beckoning. So to test out the recipe, I chose pureed strawberries and vanilla extract for my flavor add-ins. Wow. The ice cream was to die-for, rich and silky from the egg yolks and cream, and packed with true strawberry flavor. I fell in love with it. And I’ve waited a whole year to make it again. Here’s the recipe, adapted and collapsed from the “make your own” format. 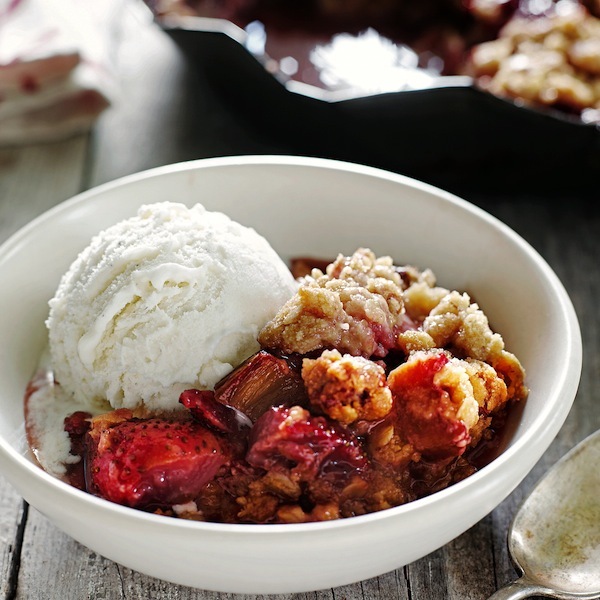 If strawberry ice cream isn’t your thing, or you simply want to try other flavor combos, visit the cool interactive feature on Fine Cooking’s website. Adapted from Fine Cooking magazine article by David Lebovitz; for more ice cream recipes, visit finecooking.com. Prepare an ice bath: Fill a large bowl with several inches of ice water (half ice, half water). 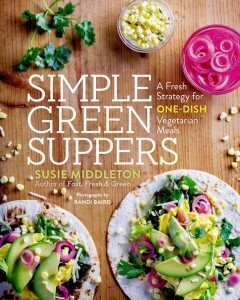 Set a smaller metal bowl (such as a stainless steel mixing bowl, at least a 6-cup capacity), in the ice water. Pour 1 cup of the heavy cream into the inner bowl. (This will help the custard cool more quickly when you pour it in later). Set a fine-mesh strainer on top. Pour the egg mixture back into the saucepan and cook over low heat (or medium low if your stove is electric! ), stirring constantly and scraping the bottom with a heatproof cooking spoon or spatula until the custard thickens slightly and measures 175°F to 180°F on an instant-read thermometer, anywhere from 4 to 10 minutes. (The custard will be a bit more viscous and thick enough to coat the back of a wooden spoon, holding a line drawn through it with a finger.) 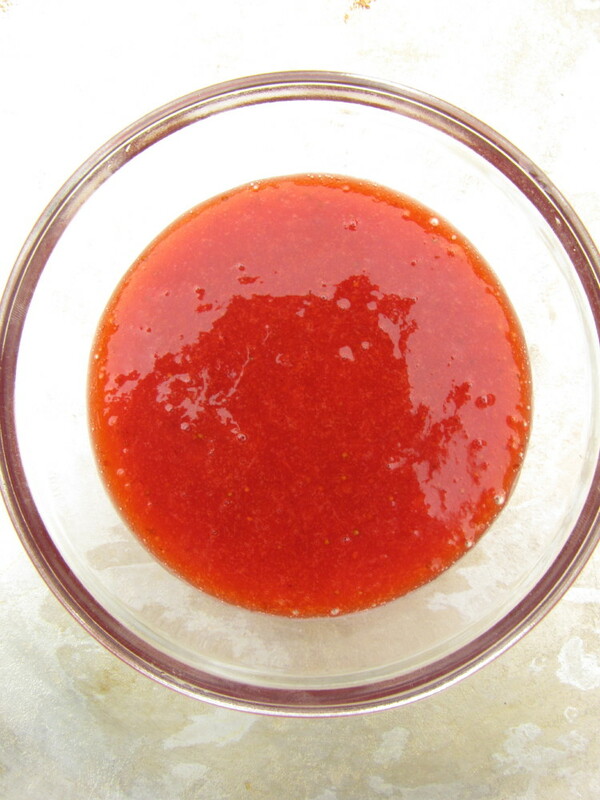 Don’t let the sauce overheat or boil or it will curdle. Immediately strain the custard into the cold cream in the ice bath. Cool the custard: Stir the custard frequently over the ice bath until an instant-read thermometer measures 70°F. Add the vanilla extract and stir. 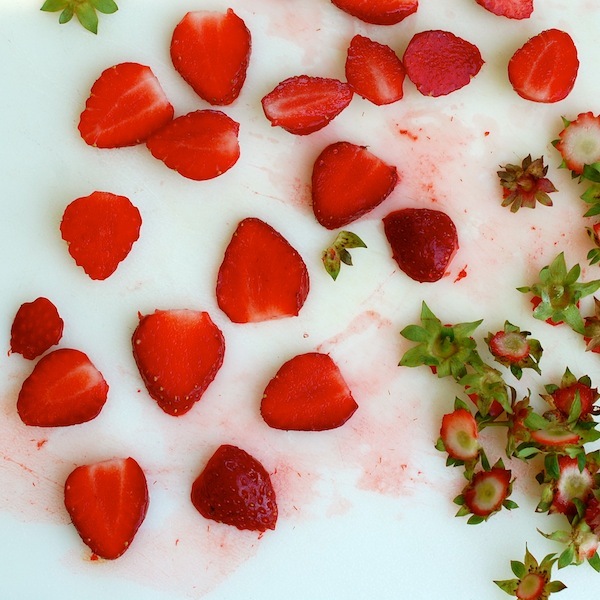 Add all of the strawberry puree and mix well. (This is one of the totally fun parts—watching the pink and cream swirls come together!). Chill and freeze the custard: Chill the strawberry-vanilla custard mixture in the refrigerator for at least 4 hours (or overnight—in fact, it holds for two days.) Freeze the ice cream in your ice cream maker according to the manufacturer’s instructions. Note: This recipe yields about 1 quart. My small ice cream maker only makes one pint at a time. If you’re in that boat, simply keep the remaining custard chilled and use it in the next day or two.